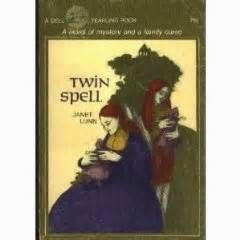 Twelve-year old twins Elizabeth and Jane didn't particularly want an old wooden doll....but something drew them to the shop where it was housed one wet day, and something drew the owner to let them have it for what loose change they had in their pockets. And something made Aunt Alice fall down the stairs of the big ancestral home in which she lived alone soon after....resulting in her moving out, and Elizabeth and Jane's family (they are blessed (?) with three brothers). And then the little doll is used by something, or someone, to draw Elizabeth and Jane into an old, sad, angry story. Visions of the past over a hundred years ago, when the doll was new, are intruding into their reality, straining their relationship with each other and compelling them to find out what happened to the girl who's doll it was...and the force behind the visions is not friendly (cue creepy music). But mostly it isn't all that creepy--it's more like a mystery to be solved with the help of supernatural nudges (primarily visions of the past, overlaying the present, as opposed to actual visits to the past), and daily life goes on, broken by trips to the library and hunts for old houses etc. Until the end, that is, which is rather intense (in a nicely scary way!). Aside: as a time travel book this one is rather interesting in that there is both time-slippiness and ghost. Mostly ghosts just manifest independently (and not as time travelers, but as, you know, lingering dead people), but here the supernatural force at work is really pulling Elizabeth and Jane back toward the past....I think this is the first in two hundred or so time travel books I've labeled as both "Timeslip Tuesday" and "books with ghosts." Creepy doll stories are always good! I haven't read enough of those myself.